Back in 2007 I came across a website which combined beadwork with scientific models and was amazed. Some of those first images I saw stayed with me and I began trying to replicate them- but for a bit of extra sparkle I used crystals. I soon realised that to help with the structure of the pieces I needed to alter how they were beaded so adapted my trials by mixing in seed beads and pow- I had lovely solid 3D beaded beads. 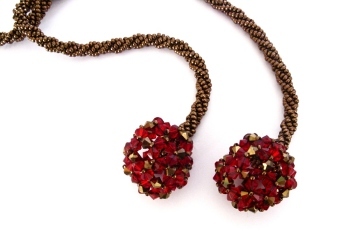 This necklace comprises 5 large beaded beads threaded onto a fully beaded rope which uses the same seed beads. The ends of the rope are finished with smaller beaded beads. 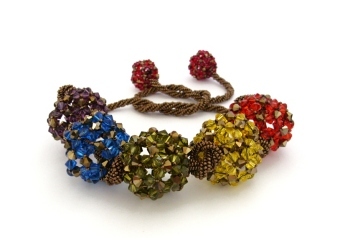 The rope can be knotted between each large bead to give a different look. 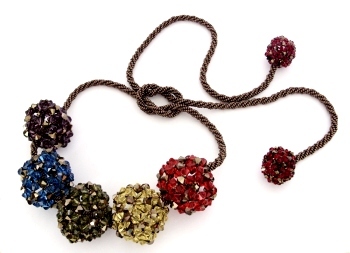 This is a substantial necklace with a lot of impact- the large beaded beads are over 1 1/2 inches across and each one uses nearly 100 6mm crystals. The colours for the piece are rotating through the colour wheel and use the primary and secondary colours (red- orange- yellow- green- blue- violet- red). You can see more about my colour choices on my Colour Challenge Blog.